All images and text HEREIN published are under Copyright protection and may not be copied or reproduced in any form whatsoever without the prior written permission of the Copyright holder(s). 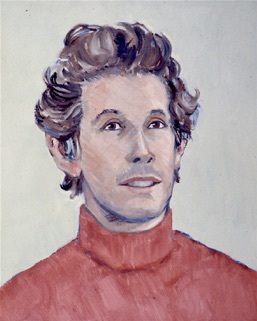 Buffie Johnson painted scores of portraits, almost all of which are either in private collections or in museums, the venerable National Portrait Gallery of the Smithsonian Institution among them. 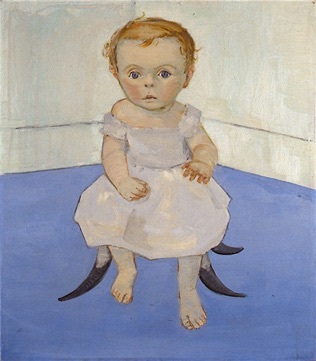 Throughout her career, and regardless of what period of her work the artist was engaged in, she continued her portraiture, capturing the essence of her many sitters. as though they did not quite belong on earth, but had drifted down from interstellar space. The early still-lifes were, themselves, portraits of a kind, at times indistinguishable in style from the human portraits that were set in very romanticized dream-like landscapes. There were also scenes of, say, a sumptuous slice of watermelon set out in a close foreground with curious vistas through mysterious doorways leading into room after room in the distance. There were numerous portraits of the usual fruits and vegetables which typify the subject of still-life, but there was always something unusual about them, something other-worldly. 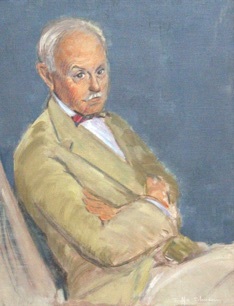 The literary critic, poet, and Classicist Horace Gregory, whom we have quoted above in regard to this “other-worldly” tendency in the artist’s portraits, remarked that following her earliest drawing of a tea-pot “came other things, the rest of the world, and some if its people, looking as though they did not quite belong on earth, but had drifted down from interstellar space. The atmosphere of arriving from some place in “a world of light” far above the earth still pervades the portraits that she paints.” (Horace Gregory, "The Transcendentalism of Buffie Johnson," Art International, Vol. IX, No. 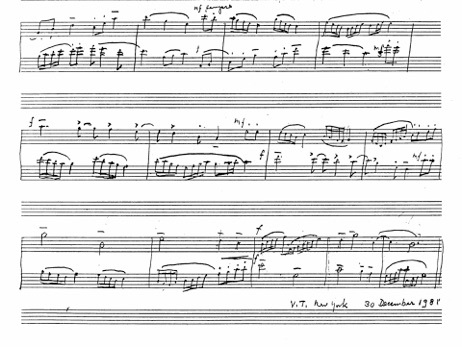 8, November 20, 1965, page 13.) The still-lifes share this quality, much in evidence in her 1942 Still Life With Eggplant, a work that equally exhibits the dream-like landscape so typical of many of the portraits. 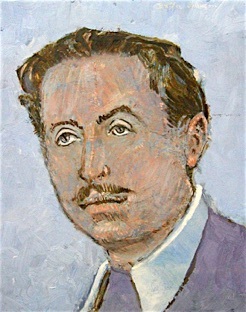 In fact, a slightly earlier portrait from the year before of The Poet (John Latouche) set side by side with the artist’s Still Life With Eggplant, shows an identical and continuous landscape as the backdrop for both “portraits”. That look of not quite belonging on earth perfectly describes the look captured by numerous photographers who made portraits of Buffie Johnson over the space of many years. 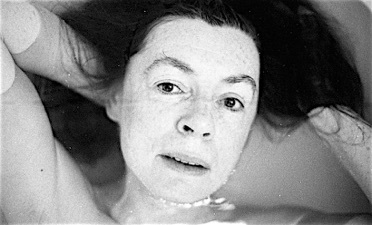 Her own self-portraits have this visage of being (from) somewhere else. 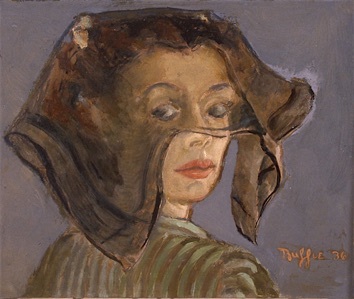 WOMAN WITH VEIL SELF-PORTRAIT, 1936. For U.S. Passports issued September 13, 1954. Magazine photo shoot, New York, circa 1943. 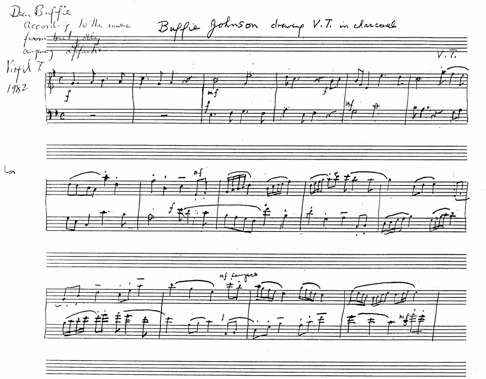 Buffie Johnson Mouthing an “O”. Buffie Johnson with street boys on townhouse stoop. for Town & Country, February, 1943. © Edward Weston, Buffie Johnson, 1943. 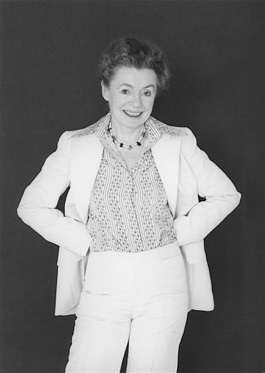 Photo by Cynthia MacAdams of Buffie Johnson, 1976. 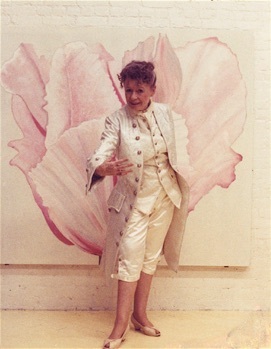 Photo by Karl Bissinger, 1988. 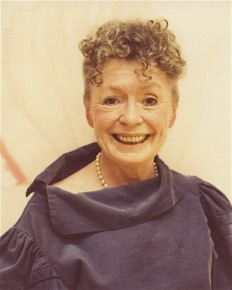 Photo by Patience Abbe, 1984. 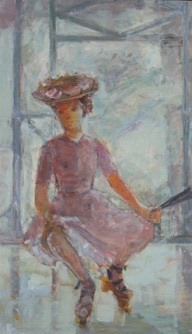 Collection of Jenny Johnson Sykes. 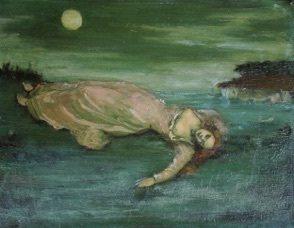 Io: Private Collection. at 102 Greene Street, New York. 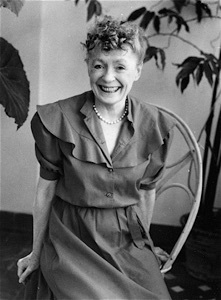 In 1937, Buffie Johnson’s first exhibition opened at Jake Zeitlin’s renowned Red Barn Bookstore/Gallery in Los Angeles. 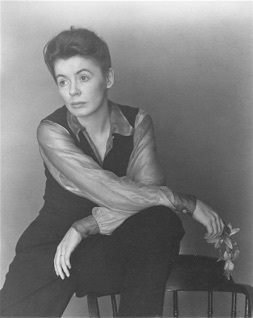 Accord-ing to the artist’s draft of her “Portrait of the Artist by the Writer: A Self-Interview by Buffie Johnson,” this was the rare books dealer who had shown Edward Weston’s first exhibition of photographs years earlier. © Tracy boyd, Floating, 1971. 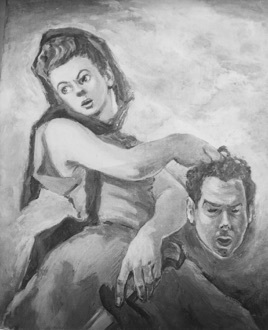 BUFFIE JOHNSON DRAWING V. T. IN CHARCOAL. V. T. NEW YORK 30 DECEMBER 1981. Burnell the Photographer, Beauty and the Beast. 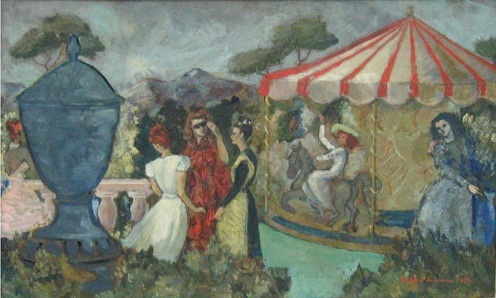 John and Mabel Ringling Estate, 1947. © Margrethe Mather, Buffie Johnson, 1933. 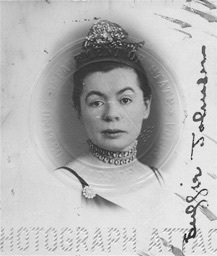 Buffie Johnson was a frequent guest at the Ringling Estate where she learned to swallow fire and perform all manner of interesting entertainments. 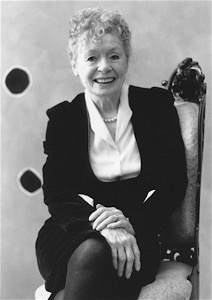 Her host, A. Everett “Chick” Austin, Jr., was the avant-garde entrepreneur of the arts, formerly of the famed Wadsworth Atheneum. He was now the Director of the Ringling Museum of Art and, aside from his enumerable other talents, was an accomplished magician in his own right. My mother often remarked that the days she’d spent exploring the treasure-filled museum warehouse and the moments she’d been in the company of the performers of the circus troupe, were the most exhilarating times of her life. She really felt that she was in her element. From Buffie Johnson’s obituary in The New York Times, September 2, 2006. © Photo by Karl Bissinger, 1949. Tanaquil LeClerq, Donald Windham, Buffie Johnson, Tennessee Williams, and Gore Vidal at the Cafe Nicholson. number of her celebrated portraits were shown, including those of her friends, playwright Tennessee Williams and the architect Tony Smith who, years later, would become a minimalist sculptor of monumental works. 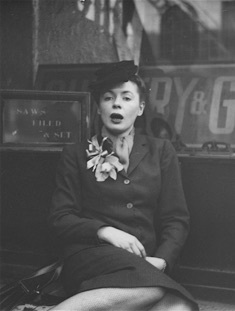 The artist herself was portrayed with Tennessee Williams and other friends in a widely published 1949 photograph by her dear friend, the photographer Karl Bissinger. 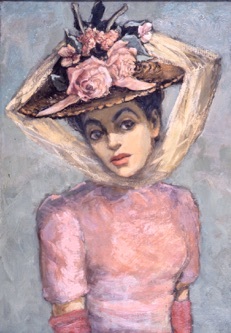 The photograph initially appeared in the first issue of Fleur Cowles’s Flair Magazine in February 1950 accompanying a piece by Charles J. Rolo titled “The New Bohemia.” The London Times ran it at about the same time and there were numerous other versions that followed of the now-famous scene at the legendary Cafe Nicholson on East 58th Street in New York. Years later it resurfaced, appearing in the July 1972 issue of After Dark. Reminiscing about her lost student days in Paris, my mother fondly recalled that in the warm and open cafe society atmosphere of late 1930s Paris, one could not help but encounter creative soul-mates every day of the week. 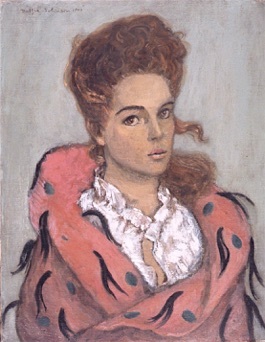 She describes this period of her life in her brief self-interview, “Portrait of the Artist by the Writer,” in which she says, “It was an incandescent time fueled by painting and by extraordinary friends . 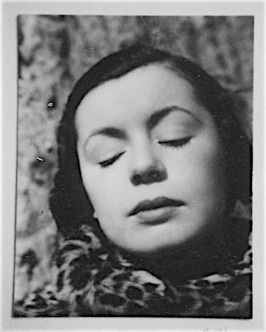 . . who’d sit and talk at the cafes.” She counted among her closest friends in those days, the Surrealist poet David Gascogne, Max Ernst, Marcel Duchamp, Man Ray, and the Romanian poet and leading Dadaist, Tristan Tzara. And nearly every evening of that first glorious 1938 summer in Paris was spent with Lawrence Durrell and Henry Miller. 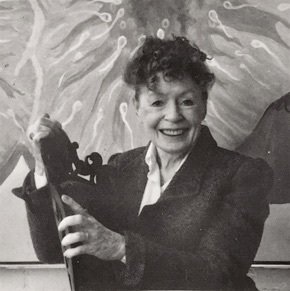 There were also her rigorous classes at Stanley Hayter’s premiere printmaking Atelier 17 in Paris, where she met many established artists, including Picasso who was in her engraving class. These were extraordinary experiences in view of – or maybe because of – the dark shadow of war that grew closer and closer as every day passed. When the war was over, some of that same “sense of belonging” could be found in New York. It was especially in evidence at the Cafe Nicholson, the very elegant cafe society hangout that would become a second home to so many creative stars and which, as luck would have it, was just down the street from Buffie Johnson’s 58th Street townhouse. Karl Bissinger was an established fashion photographer at the time that he made this most famous of photographs – just one among so many of his grand photographs. And he was Johnny Nicholson’s partner in this very successful cafe venture. This group of friends were his friends, all of whom had become friends before they had made a name for themselves – when they were aspiring to become who they would become. At this particular moment in time, all of those pictured had already made their marks upon the world. The twenty year-old Tanaquil LeClerq who had danced with Balanchine’s School of American Ballet from the age of twelve was now a principal dancer with the New York City Ballet. 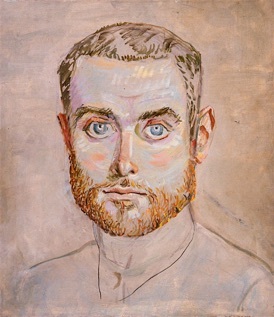 A not quite thirty year old Donald Windham, who seems to be studying the ballerina, had been a contributor to and editor of Lincoln Kirsten’s Dance Index, and had then collaborated with Tennessee Williams on the Broadway stage play of D. H. Lawrence’s story, You Touched Me. 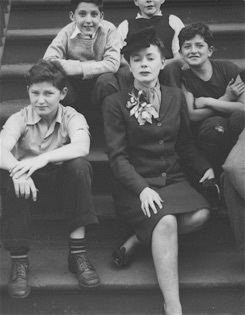 Gore Vidal (far right) is imaged as the picture of youth itself. 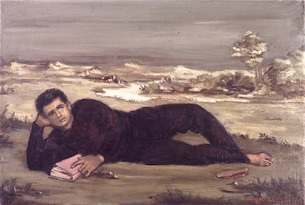 This gorgeous twenty-four year old had, by the time of the taking of this photograph by his dear friend Karl Bissinger, published four novels. Seated next to him is Tennessee Williams, the oldest of the group by nearly a year, who had won the New York Drama Critics’ Circle Award in 1945 for his The Glass Menagerie, and in 1948, accom-panied by wide adulation, the Pulitzer Prize for Drama for A Streetcar Named Desire. 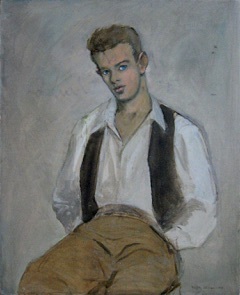 In between all of this fame, he had managed, one summer in Provincetown, to sit for his portrait by his friend Buffie Johnson. 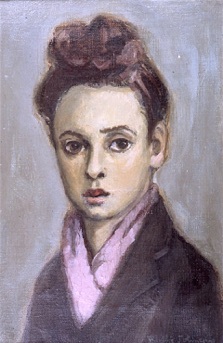 Her 1947 portrait of him now hangs in The National Portrait Gallery of The Smithsonian Institution in Washington, D. C.
Regardless of the persistence of snippy false rumors that these two friends had parted company on bad terms in the 1950s, a lie that was promulgated in her obituary in The New York Times despite gallant efforts to convince the writer of its falsehood, they remained good friends until his death. 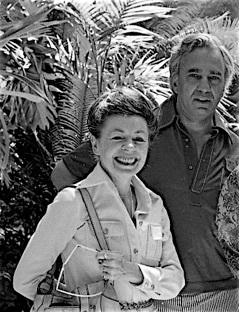 In 1977, when Tennessee Williams’s play, Vieux Carre, was set to open at the St. James Theatre on Broadway, my mother was the person whom the playwright entrusted to sit next to him to calm his very frazzled opening-night nerves. So much for rumors! 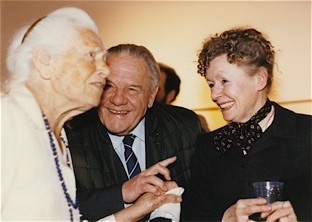 Buffie Johnson (center) who, it seems, really did know everyone, was, at the age of thirty-seven, now an established artist who had had thirteen solo exhibitions and had participated in numerous group shows including the celebrated 1943 landmark show, Exhibition by 31 Women, curated by Marcel Duchamp and Max Ernst and mounted by Peggy Guggenheim at her famed Art of This Century Gallery in New York. of The Smithsonian Institution, Washington, D. C.
All was not solemnity and solitude on Briar Patch Road in East Hampton. And while others may have been “far from civilization unquote,” we ourselves were not as far away as some may have imagined. 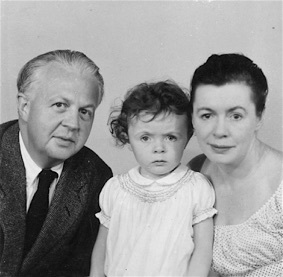 My mother, as you know, was an artist; my father, Gerald Sykes, a writer and critic. Their circles crossed, criss-crossed, and over-lapped so many times that it was a wonderment that it had taken so long for them to meet. They knew so many of the same people that it was inevitable that the cafe society spirit would live on in some other incarnation. And so it did, with an ever-replenished stream of artists, writers, poets, playwrights, composers, actors, dancers, mythologists, analysts, publishers, art collectors, philosophers, diplomats, intellectuals and, of course, photographers, who visited “Windover,” our house in East Hampton. These were the people who made up our world in East Hampton and in New York. Most of these people knew each other, too, and there was rarely more than a degree or two of separation between any of them. This was the way things worked in New York and its nearby summering holes when New York was New York. 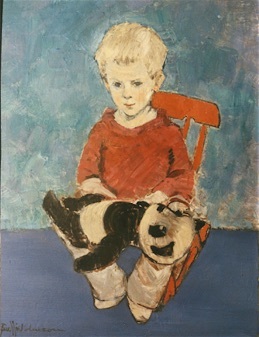 These were the people that my mother painted even while she was working on what she called her “regular” paintings, by which she meant whichever specific style she was painting in at the time. from e. e. cummings, 6 Wyman Road in Cambridge. This was the entire message! In East Hampton, everything was abstraction. The great eastward migration of artists and writers from New York to East Hampton started with Jackson Pollack and Lee Krasner and spread like wildfire. There were so many artists by 1962 that they could barely fit into one photo-graph. Hans Namuth’s unforgettable “Asparagus Beach” photograph has been re-produced again and again. It is the portrait of all portraits. 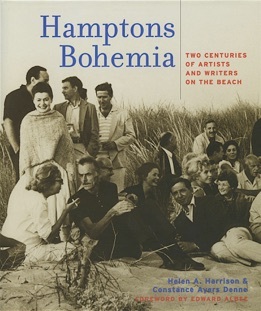 The image shown here, which is only half of the whole photograph, appeared in 2002 on the cover of Helen A. Harrison and Constance Ayers Denne’s commemoration, Hamptons Bohemia: Two Centuries of Artists and Writers on the Beach with a forward by Edward Albee. Standing second from left, Buffie Johnson looks right into the camera. The full photo, with a list of the entire cast of memorable characters, is in Hamptons Bohemia. © Photo by Hans Namuth, 1962. Everything in East Hampton seemed bigger than life. I don’t think that it was my child’s perspec-tive that made it seem so. 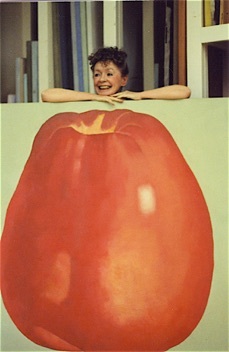 Everything really was bigger than life - especially the art. In the late fifties, my mother was commissioned to create the murals for the Astor Theatre in New York, a work of art that would turn out to be the largest abstract painting in the world. Each canvas panel was ten feet by five feet, and there were 224 of them. There were also two additional panels, each measuring ten by twenty-five feet. A long-time friend, the photographer Ambur Hiken, documented the progress of the making of the murals at the same time as she was preparing the images for her own book with Betty Alswang, who wrote the text of The Personal House: Homes of Artists and Writers. 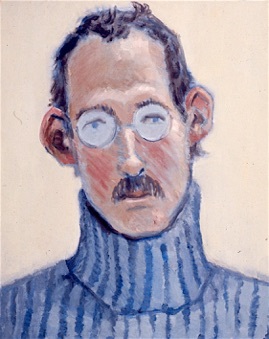 These were portraits of a kind that captured the life of an artist surrounded by a sea of ultramarine blue. I was dazzled by this sea of blue every day. I would come home from school and there would be more of it than there had been when I had left in the early morning. For a very long time I was convinced that my mother was some kind of a magician. 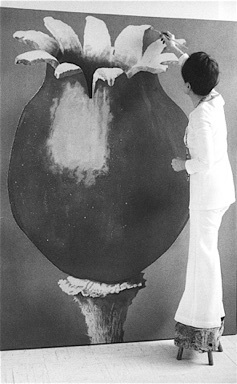 There was a super-human quality about the multiplication of these huge paintings that emerged from her studio day after day. And, irony of ironies, the unveiling of the completed murals took place in the Astor Theatre on my 9th birthday. I thought it a most spectacular present. 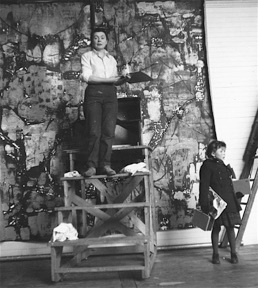 Buffie Johnson, standing on her painting stair, and Jenny Johnson Sykes, schoolbooks still in hand, inspect the days work on the Astor Murals. Photo by Ambur Hiken, 1959. When we moved (back) to New York in 1966, the photographers, it seemed, came with us. 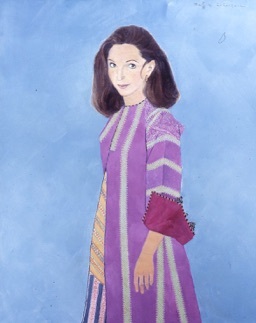 A sampling of portraits of my mother from that period – some of her favorites – have been included in the images shown above. I add a few more here for good measure. © Photo by Tracy boyd, 1970. Putting the finishing touches on Lapis 82” X 68”. © Photo by Tracy boyd, 1971. 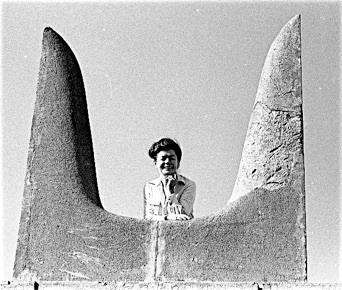 © Photo by Tracy boyd, 1973.
near the Palace of Knossos, Heraklion, Crete, 1973.
at her studio at 102 Greene Street, New York. Stella Snead, Lawrence Durrell, Buffie Johnson. MOST ARE IN PRIVATE COLLECTIONS, BUT . . .
On January 26, 1947, the New York Sunday Mirror ran a story about “a treasure trove of 17th century garden sculptures” from northern Italy that the Ringlings had purchased two decades earlier. 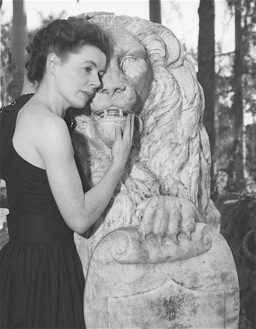 The statues, including the stone lion, had been languishing unseen under tropical foliage all those years on the Ringling Estate in Sarasota, Florida. The new director of The John and Mabel Ringling Museum of Art had uncovered them, and the elephants, who always wintered on the estate, were taking great pleasure in helping to rescue the statues from their jungle of oblivion. 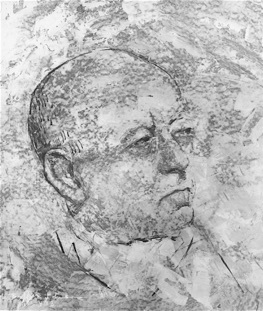 BUFFIE JOHNSON’S 1963 OIL PORTRAIT OF VIRGIL THOMSON. of The University of Missouri at Kansas City, Missouri. at 231 East 77th Street, New York. 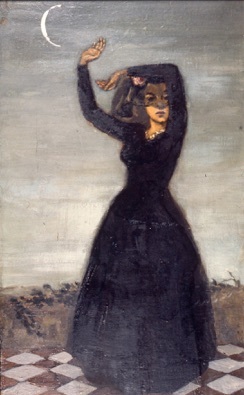 JUDITH WITH THE HEAD OF HOLOFERNES, 1942. 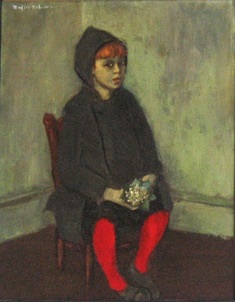 NED (GIRL IN RED STOCKINGS), 1940. 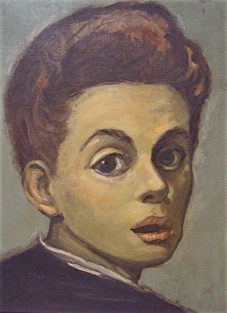 This was the 1944 show at Caresse Crosby’s G Place Gallery in Washington, D.C. 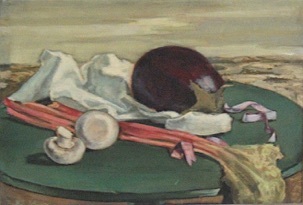 STILL LIFE WITH EGGPLANT, 1942. 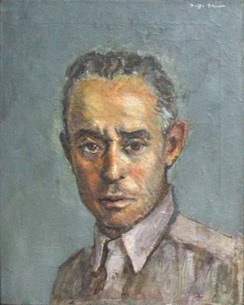 THE POET (JOHN LATOUCHE), 1940-41. 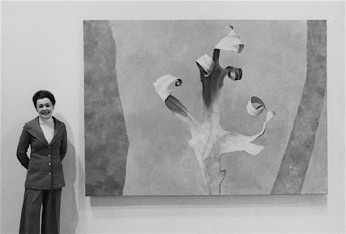 Occasionally, too, there are compositional similarities between Johnson’s still-lifes and portraits. 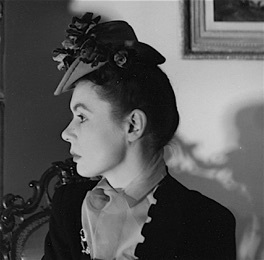 We see this in her 1942 Ariadne: Danger of Contemplation, a painting that we have discussed at great length in “From the Very Beginning . . .”, and Still Life With Asparagus, whose white tablecloth is every bit as sumptuous as her flowing landscapes. 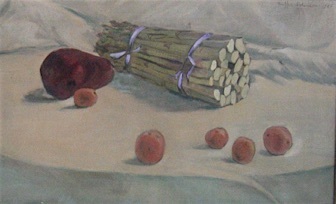 STILL LIFE WITH ASPARAGUS, 1945.